We all know that going on hunting can be a whole lot of fun, right? But you want to make sure you have the right tools to make yourself better hunter. If you’re hunting with a muzzleloader you definitely know that this includes having the best muzzleloader scope to ensure you have a good eye for whatever it is you’re hunting. The key is to look at your gun and the features that make up a great quality scope for muzzleloaders and then make sure you have everything you need to make this a successful hunt. Luckily, it won’t take too much to find just what you’re looking for if you check out this article. If you haven’t hunted with a muzzleloader rifle before, there are some things you should know. The first is that a muzzleloader requires you to load each shot, taking more time, skill and precision to get exactly what you’re trying to hunt. This isn’t the type of gun you want if you think that deer is going to be way out there or if you’re not willing to do some walking to get in range. 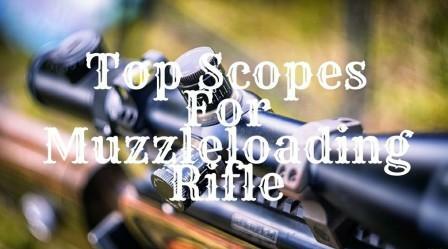 these are 5 good muzzleloader scope reviews included in our list that will work with a variety of different guns and provide you with some excellent features. They’re each included because you’re going to get what you’re looking for at all different price points and you’re going to have something you can count on. The Nikon INLINE is BDC muzzleloader scope which has a matte black finish that makes sure you can always see your target but it definitely won’t see you. It has fully multicoated optics, that ensure you have a good picture and you can always adjust the scope however you see fit with the spring-loaded instant zero-reset turrets to help. Designed to work with the Nikon Spot On Ballistic Match Technology for the finest possible picture, you can get plenty of magnification with this no matter what therefore it is best muzzleloader scope under $200. Mountable with a standard 1” ring or any of your favorite mounting techniques, this scope works with a number of different guns up to and including muzzleloaders and shotguns. The scope itself comes with a lifetime warranty, so you know you’re always getting high quality and it’s extremely clear. The gun is easy to sight in and easy to adjust whenever you’re switching magnification or even moving it to a different gun entirely. It even holds your adjustments so whenever you pick it up it’s right where you left it. Combining all of these specifications it makes it best inline muzzleloader scope. The Leupold UltimateSlam is priced around $250, which makes it a bit more expensive than the last option, but it has many similar features. It offers the same magnification and a quality matte black finish that keeps reflections at bay. It is best muzzleloading scope by Leupold, which is well known in the shotgun and muzzleloader realm, this scope is able to be attached in several different ways and to a variety of different gun types including 12 gauge and 20 gauge shotguns. It provides excellent clarity as well as brightness and contrast and is durable for absolutely anything. It’s adjustable for elevation as well as windage, so you can shoot no matter where you are or what the conditions may be. It also has distinct hold points for 50-yard increments between 50 and 300 yards. The multicoated lens system is standard, providing the level of superiority you expect from your scope. It sights in using a dot and cross in the middle and works extremely well even with low lighting. In case of any problems, the customer service from the company is top notch and you’ll always be able to get whatever you’re looking for. The Leupold VX isn’t quite as high tech as some of the other Leupold scopes, but it does have some great features and provides you with 1x-4x magnification. With this scope, you’re getting something lower priced that will provide a good amount of magnification for those who don’t want to shoot quite the distance. At half the price of the last one, it’s also about half everything else as well. It attaches with rings and has a matte black finish so you won’t be spotted when you’re hunting. It’s made with heavy duplex and offers the clarity, brightness and contrast that you’re looking for. It uses Micro-friction dials to get the ideal elevation for wherever you may be and has a generous eye box that also makes it very easy for you to sight in for the first time and each attempt after that. It’s forgiving of magnification settings as well and is entirely waterproof so it stands up to drops in a stream or river. Adjustable for elevation as well as windage, it is lightweight and ready to go. Waterproof, fog proof and shockproof, this scope is able to withstand anything that you throw at it (or throw it into). It’s durable and long lasting with all the features you’re looking for. It has a locking fast focus ocular as well as the reticle on the second focal plane so it’s easier to use and even easier to focus and sight in for the first time. It can be mounted with a ring for easy adjustment and removal and fits on just about any gun that you want to shoot, including shotguns and muzzleloaders, and anything you want to shoot at. Heavier weight at 2.6 lbs. There are actually a number of different features you want to look at when you’re purchasing a muzzleloader scope. We’ll talk about some of them right here, but they include things like the price and brand (though these should never be your first considerations) magnification, your gun, durability, sharpness and simplicity. Having adequate magnification on your gun is important because this dictates whether you’ll be able to see the deer, bear or other animals that are out there just waiting for you or not. A 3x-9x scope is going to be ideal for just about anything you need to do, with a 10x scope being the absolute largest that you’ll need for anything. 10x is what the snipers use and if it’s good enough for them then it’s definitely good enough for you. You always want to make sure that the scope you’re getting is compatible with your gun before you buy it. A new scope can be expensive and if you spend a lot of money on it you definitely want to make sure you’ll be able to use it. This could mean checking the size or the attachment method to make sure it’s going to work properly. The scope on your gun needs to be resistant to drops and scratches. If you turn around sharp and hit your scope on a tree you want to be able to rely on it to maintain zero just like nothing ever happened. If you drop it on the ground and then want to fire a shot you need the same thing. The gun needs to be strong and durable, no matter what happens to it and no matter how long you have it. Also known as resolving power, the sharpness is how well you can pick one specific thing out of the background of your gun. If you’re looking at a field of trees in your scope and there’s one little tiny brown spot that represents a deer you should be able to recognize it easily. You should be able to recognize the brown of that deer hide in a field of dead, brown trees as well. That’s how sharp your image should be. Don’t jump on the bandwagon for a bunch of high techs, brand new features. You want a scope that’s going to let you see that animal you’re aiming at and not a whole lot more. You don’t need a lot of extra features, so make sure you’re not paying a lot for them. The more features and complexities that your scope has the more likely that something is going to break or go wrong and now you’ve got to shell out even more for a new scope. Also known as a bullet drop compensator, this type of scope shows you the crosshairs and then shows you a few additional dots down the center that show where the bullet will drop depending on the distance that you’re shooting. For a lot of hunters, this can mean the difference between getting the shot you were hoping for and missing entirely. Some people love them while others think of them as unnecessary or a ‘cheat’ on getting that perfect shot. In most cases, they can definitely be worth the money. Always go with a matte finish for your scope. A deer or rabbit or bear or anything else isn’t stupid. If they see the shine of the sun reflected on your scope they are going to run faster than you can pull that trigger. It’s not going to do you any good other than to look shiny and let the animals and your fellow hunters know that you have no idea what you’re doing. Don’t skimp out when it comes to buying a good scope, but don’t spend a small fortune either. Most scopes are going to have the basic features down pat for you, so it’s only a few specifics like the magnifications and the weight that you’re really paying more money for. Things like brightness are standard. Don’t pay a lot of money for it. A good brand name is going to be synonymous with quality, but there aren’t a lot of low-quality brands out there. Look for Nikon or Leupold and you’ll have something from the best, but if you pay attention to the most important features you should be able to find a good quality scope no matter what brand you choose from. Konus, Thompson, and Weaver make high-quality options as well and make sure that you’re going to be comfortable and more than happy with the way it works on your gun. No matter which of these muzzleloader scopes you choose, you’ll have a way to really enjoy your hunting experience and make sure you get that animal you’re going for. A successful trip could live and die with the best muzzleloader scope, and so will whatever it is you’re hunting. If you’re looking for the most power the Konus Pro provides you with that but when it comes to low price you can’t go wrong with the Nikon INLINE.